Here are some of the thrift shop treasures I picked up over the last couple weeks. This flowered tea pot came from the Discovery Shop that benefits the American Cancer Society. This blue and white mug came from the Discovery Shop as well. I like it for ice water. This Faberware Stoneware bowl is from the Goodwill. I think I paid a dollar for it. The pattern is called "English Garden." This plate came from a thrift store that specializes in cottage items. The woman behind the counter said it was probably from the 1930's. She got flustered when I told her the plate has "microwave safe" on the back. I bought it anyway because I'm slowly replacing my current boring plates with cute thrift store finds. The egg holder, vintage linens, and doilies are some of the items I purchased for the vintage swap. You can see all of the items I sent to Deb on her blog, Garage Sale Gal. My birthday is next month, and I'm saving up to take myself on a little thrift store shopping spree. I can't wait! Did you notice I changed my Blogger image? 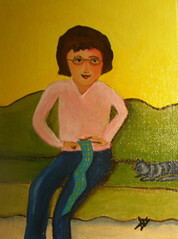 The new image is from a picture my talented sister Feltypants painted of me a few years ago. Here is the whole painting. I'm on the couch knitting with my cats Charlie and Apollo close by. Now, just picture her 70 pounds heavier and voila! That's me. OOoo thanks for sharing your thrift shop treasures. What great finds. The plate is so pretty and I love the teapot. I love the painting by your sister. You are obviously are a very crafty and talented family. I really like her style. You found some great items and I love the painting your sister did! I noticed right away your new banner/header..and it's Wonderful!!! and I noticed the painting too..It's fun to change things around!! Guess I better get working on my ATC card this weekend...have some ideas floating around in my little head..
How wonderful to have sister to paint your portriat! Love your finds at the thrift shop - especiallyt he sweet teapot. Wow... your finds are gorgeous... but it is the teapot I'm in love with... it's so beautiful!! And it has a strainer... I have teapot envy right now!